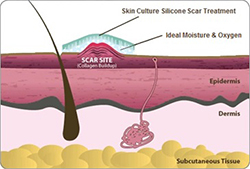 Silicone Scar Treatment is an advanced product for the treatment and management of scars no matter how old or how new. Silicone Scar Treatment is effective on the most severe and difficult of scars, including acne scars, hypertrophic scars, and keloids. It works equally well on scars caused by burns or scalds, and those caused by the removal of stitches or staples after surgery. Silicone Scar Treatment softens, flattens and smoothes scars and improves the and texture of both the scar itself and the surrounding tissue. It visually and structurally diminishes scarring until it is virtually indistinguishable from the healthy skin around it, making it more cosmetically and socially acceptable. It also relieves the itching and discomfort of poorly healed scars. Once applied, Silicone Scar Treatment dries to form a protective, microscopic barrier that is semi-permeable, allowing oxygen to enter whilst keeping excess moisture out. This barrier both hydrates the scar and protects it from chemical and microbial attack, and so provides your body with the optimum conditions it needs to complete its natural healing processes in the most effective way possible. Collagen production and tissue regeneration (the essential processes involved in wound and scar healing) can go into overdrive without such intervention. But when you apply Silicone Scar Treatment they are instead able to take place in a much more structured and organised manner. Clients tell us how much flatter, softer, smaller, smoother and, yes, prettier their scars are after use. They tell us how great it is to see the scar gradually return to the color and texture of the normal skin around it.